The longtime Marco Island musician, composer, songwriter and producer will perform what he describes as “a musical monologue,” on September 10 at The Marco Island Players, located in Marco Town Center. – Arkansas Traveler.” He said the state’s musical palate was heavily influenced by the folk music of the Scots-Irish who mi- grated from Georgia and North Carolina, as well as the blues and other music created by Florida’s black population. The show also includes more modern selections that are identified with the Sun- shine State, such as “Margaritaville,” “Hot Hot Hot” and “Rhythm is Gonna Get You,” along with a few JRobert originals. “It’s a collage,” he said. 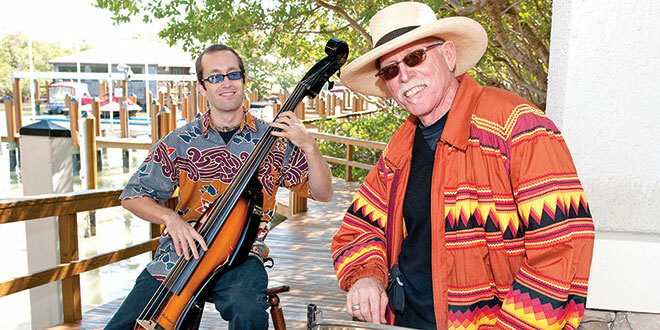 The music will be interspersed with JRobert’s musings on the state’s history and evolution, as well as his family history, including tales he heard while growing up from a grandfather who farmed in the Everglades. 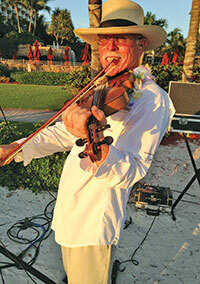 JRobert performs on Marco Island’s beach. JRobert’s life’s journey has taken him from the Everglades, where he spent part of his childhood on his family’s farm, before his father transplanted the family to Tampa to attend college. The family eventually found itself moving around the country due to J.E. “Dooley” Houghtaling’s career designing nuclear reactors. As a young adult, JRobert spent many years based in the Northwest, playing with a touring band. Over the years, he’s played with or opened for such headliners as John McEuen of the Nitty Gritty Dirt Band, Charlie Daniels, Bonnie Raitt and Jimmy Buffett. He returned to Florida to be near fam- ily, living in Ruskin and working in his father’s orange groves, before moving to Marco in 1986. “I came in for a weekend to play at Quinn’s (On the Beach) and here we are 30 years later,” said JRobert. And there was an additional source of inspiration. When: 8 PM, Sept. 10, doors open at 7:30 PM. Cost: $20 for adults and $10 for students, exact cash or check at door. Tickets avail- able at the door the night of the show. For more information about JRobert: Visit jrobert.net, MangroveMusicStudios. com or FaceBook.com/JRobertMusic.